5 mo old, Postop. day 3 after AVSD repair. 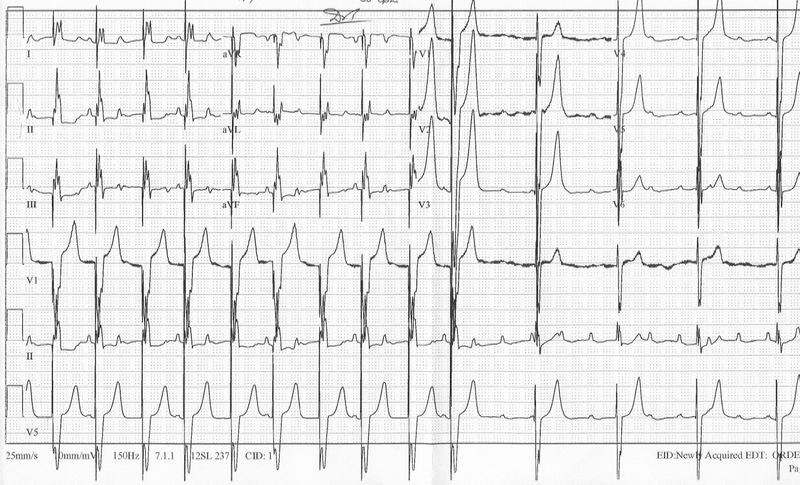 1) What is different between first half and second half of the EKG trace? 2) What type of pacing is being done? 3) What is the pacing rate? 4) What is the atrial rate? 5) What is the native ventricular rate? 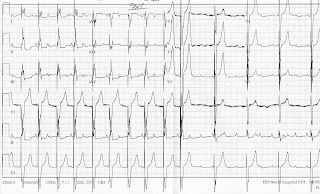 6) What is the diagnosis for the underlying rhythm? Rob, good attempt. You got the diagnosis, VVI pacing right. Here are the answers: (1) Pacemaker is on in the first half of the page and off in the second half of the page. (2) VVI mode is correct. (3) Pacing rate is 120/min. (4) Atrial rate is 150/min. (5) Native ventricular rate is 60/min - second half of the page. (6) Complete heart block.